A photograph shows a marble bust of Aristotle. He wears on his shoulders an earth-colored alabaster mantle, contrasting the white marble of the bust itself. This marble bust of Aristotle is a Roman copy of a Greek work thought to originate around 330 BC. 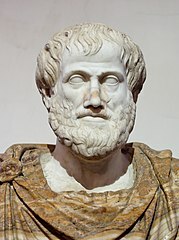 Aristotle was a philosopher and scientist who advocated empiricism and observation of phenomena within their natural habitats, indirectly influencing the development of medicine within ancient Greece. He also contributed a number theories regarding biology and medicine directly. At the time of photograph, this work was housed in the National Museum of Rome. Ackerknecht, E. H. (2016). A short history of medicine. Baltimore: Johns Hopkins University Press. Bendick, J. (2002). Galen and the gateway to medicine. Bathgate, ND: Bethlehem Books.